A group of juvenile Yellows hanging out in a branching Pocilloporid coral in Hawai'i. Bob, I've been reading your web site and see a figure you should update. The number of large size yellow tang 4.5"> populations are within 10% of each other in and out of the FRA's which bodes well for the continual sustainable supply of recruits. You had 48% several years back. 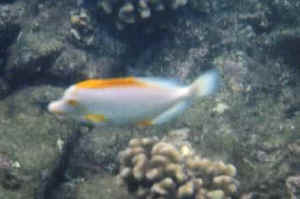 A few years back Bob, we had seven different drops of yellow tang in one year. Sometimes it occurs when there are more baby yellow tangs than homes and food for them. Yellow Tang >Hi Crew, >>Greetings, Marina this morning. >Have a Yellow Tang about 5 inches long. It is fine except for a "habit" it has developed. (I think) There is one certain live rock it seems to keep hitting with the tail and tang portion of his body. When he is facing you straight on you can see the scales are rough but no other marks etc. Because of this repeated hitting of his tail on this rock, little light red spots have appeared. Are these bruises, or is there something else going here? >>Well, while Yellow tangs are known to sometimes be aggressive, it's not normal for them to be so with inanimate objects. It sounds to me as though you have the beginning of a possible parasitic infection. His scratching (and the openings in the skin) will leave him open to secondary infection. >He eats very well seafood gourmet, seaweed, Spirulina, general pellet food and parboiled broccoli. >>GREAT! We love to hear of well fed fishies! >I have put malachite green in the tank for the last three days (darting and scratching). Our local dealer said he had no idea except to use Melafix treatment. I thought I would ask the experts. >>Ex-who? LOL! Hardly an expert here, but I've had a bit of experience. It would be helpful to know (if you have this information logged) your water quality parameters, include residents as well, timing of additions, anything and everything is helpful. >>Anyway, this is my recommendation: set up a quarantine/hospital tank for the fish. IF you have ich, then you'll do best to remove all fish to hospital and allow the tank to lie fallow for 6-8 weeks (especially if you have invertebrates in the tank). When you pull the tang, perform a freshwater dip, matching the freshwater to the salt for pH and temperature. Then place him in quarantine, where you can treat him (assuming he's otherwise fat and healthy) using hyposalinity (very low specific gravity), on the order of <1.011-1.010 is what works for killing Cryptocaryon and Amyloodinium. While he's in q/t, (bare bottom tank, with pieces of PVC for hiding spots and "structure") be sure to siphon off the bottom of the tank every day, this helps to remove cysts that have fallen off the fish and prevents reinfection. >>At this time you can also treat with a good broad spectrum antibiotic to avoid/treat secondary infection (since he's rubbing himself raw this is likely). Many folks like Melafix, I happen to like the results I've seen with Spectrogram, other folks like Maracyn (also Maracyn II). He'll need to be treated like this until you see clearing of the bloody bits, (I know you haven't mentioned seeing any spots, but I know of no bacterial infections in fish that cause itching), then leave him in normal conditions until the display has run fallow at least 6 weeks (you can also raise the temperature to 80F-83F to speed up the life cycle of the parasite). Assuming that the infection is low-grade, and that the fish doesn't experience a relapse, you should be able to utilize these treatments and be done with it. >Thanks in advance for your time and help.